In February I hit both my targets, making something from my new cookbook and baking something. On the baking front I made a pie, before there are few things more comforting on cold winter nights than a pie. 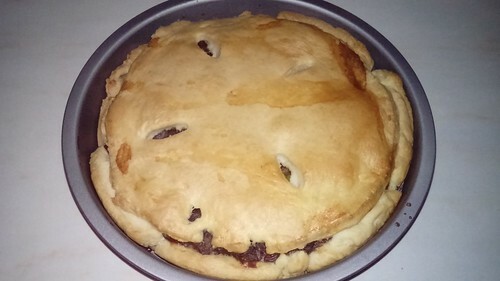 This was a mushroom and chestnut pie, for which I finally got round to buying an actual pie tin, so I managed to actually get the pastry ratio right to give it a full lid! Though I did end up making too much filling for the pie due to it not being my usual ‘deep-dish’ pie, and I found the filling to be a little dry – I think it would have benefited from a bit of spinach of to keep it moist, or made just a more runny sauce. I have the fear of ending up with a ‘soggy bottom’ but I think my insistence on blind baking my pie before-hand probably means I’m safe on that front. From my new cookbook I made a variation of the ‘Carribean cups’. 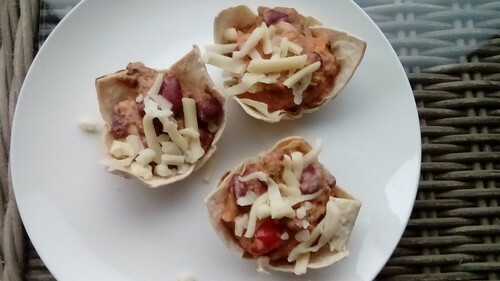 One of the alternate versions Lorraine suggests is to fill the cups with chilli con carne and I happened to have some leftover veggie chilli in the fridge needing used up. These are a slightly fiddly but delightful little dish. They make a fun lunch, the kind of thing that with a bit of practice would make a good way to turn leftovers into something a bit different when you unexpectedly have guests for lunch. Though probably only the kind of guests that don’t mind getting a little messy. I was somewhat less successful in March, but nonetheless I managed some other successes. I discovered I had a bag of pearl barley in the cupboard, that had clearly been bought for a particular recipe many moons before and then forgotten about, as it needed used up that month. So I did a bulk cook of the pearl barley and attempted to fork my way through one of the Guardian’s four ways with a bag of what have you articles. In the end I only made two of the recipes but I made the sausage casserole several times and it’s a thing of gloriousness. 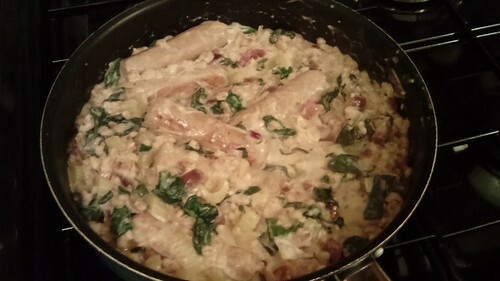 Finally I’ve found an effective and tasty way to cook quorn sausages so that they a) taste nice and b) actually successfully quash my occasional bouts of sausage cravings. It’s a really satisfying and filling comfort food this dish and I recommend adding a couple of sticks of celery to it if you have them. Add them just before the spinach, so they get nice and tender but still retain a bit of bite to give the casserole more texture. I only used them because I found some lurking under the spinach in the salad box but I now can’t imagine the dish without it. In April, despite best intentions involving muffins, no baking actually happened. However, I did actually cook something from my cookbook adapting a chilli con carne recipe for quorn mince. Which was, fine. Over the years I’ve evolved my own veggie chilli recipe that I make a few variations on, depending on what I have in the fridge and this recipe couldn’t hold a candle to it. I mean, how much can you truly believe in a chilli con carne recipe that doesn’t involve kidney beans anyway? Perfectly edible, just a bit disappointing.